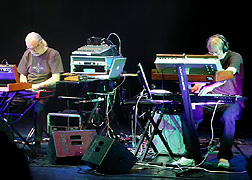 The UK duo of Ian Boddy and Mark Shreeve perform together as Arc and sing the mental electric with an inventive sonic flair. Although Umbra (78'22") was recorded at the E-Live Festival in Oirschot in The Netherlands on 19 October 2013 the true setting for this live CD is the border between reality and fantasy. 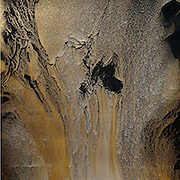 Umbra proceeds not by chorus and verse but by theme and variation - its cosmic beauty easily experienced over and over. While tone and atmosphere dominate this music, Arc never relinquishes the power of mood. Bursting with raw feelings Umbra is the tale of two madmen experiencing the danger and glory of self-expression in the live venue. For Shreeve creating music with his vintage Moog modular synthesizer must be sonic heaven. From this instrument's storm force of sound comes a delightful throbbing bass pulse, echo-warping chimes and sequencer machine patterns against which the two musicians sway and play synthesized strings, organ and heroic lead lines. Boddy's course corrections and contour adjustments move each of the six tracks through their own journey from dark to an even darker shade of dark. Mellotron strings and choir fill the upper register and hope to never touch the churning drones and space winds howling below - while the brief experimental zones leave us searching space for an access point. Umbra concludes with the concert's encore piece, an optimistic and upbeat heart-pounder full of high-octane drums, rock melodies and of course a pumping bass foundation. Fortunately for the Spacemusic community Boddy and Shreeve share the belief that our interior lives are far more important than whatever direction pop culture is rushing. But this music should not be thought of as an escape, but rather as something for the thoughtful people already populating the monastic backwaters of the ambient elsewhere - however far from the mainstream that realm may be.